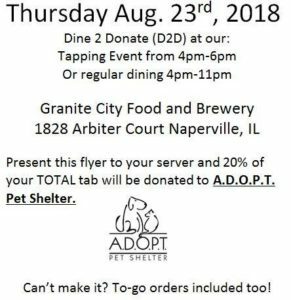 Thursday August 23rd, 4pm – 11pm at Granite City Food and Brewery, 1828 Arbiter Ct Naperville, IL. A portion of your purchase will be donated to the shelter. Be sure to present the flyer that can be viewed on your phone, picked up at the shelter or simply tell your server you are dining for A.D.O.P.T. Even more exciting, a special tapping event will be held from 4pm-6pm with free beer tasting, games, and prizes! Win a prize, eat a great meal, and support A.D.O.P.T. It is a win, win, win! We hope to see you there! Carry-out orders are included too!